On Saturday evening I had the pleasure of attending my first Brewmaster’s Weekend at Vail Cascade Resort. I typically do most of my craft beer tastings along the Front Range, as it is nearest to me geographically. So once I found out about the Brewmaster’s Weekends in Vail, I couldn’t wait to get into the mountains and experience it for myself. This month’s featured brewery was Breckenridge Brewery, who I know and love, though this would be my first food pairing with their beers. 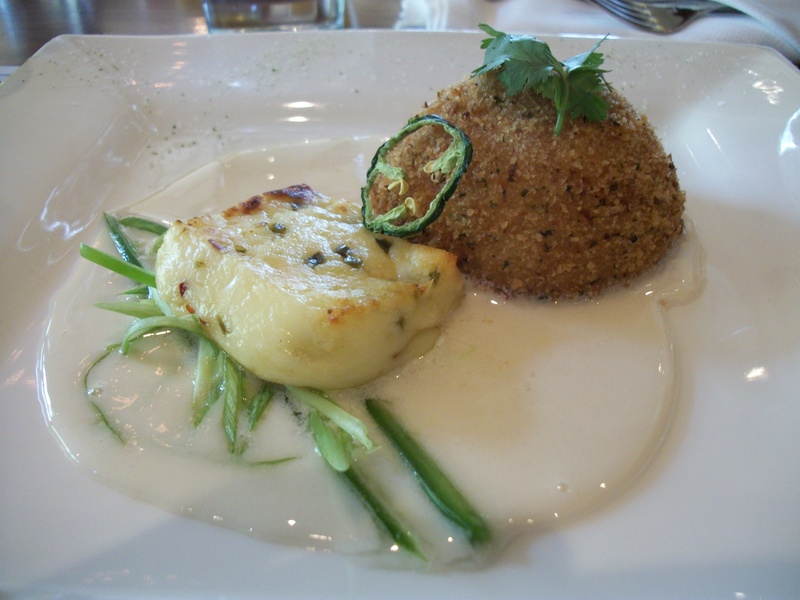 The first course was a Jalapeno Gremolata Crusted Peach, with bread cheese over an agave tequila sauce. The peach and the agave tequila sauce definitely provided some heat and was served with Breckenridge’s Agave Wheat, which was the perfect light-bodied beer to take the edge off the spice. I am a huge fan of cheese; it’s probably my favorite food, yet somehow I had never before heard of bread cheese until this meal. It was thick and chewy, a texture I thoroughly enjoyed, not to mention its wonderful flavor; I am craving more of it already! The second course was Plum Stuffed Duck Breast with saffron faro risotto and a cacao nib stone fruit sauce. If you’re wondering if the photo above is incorrect, well…it’s true it is not of the duck. 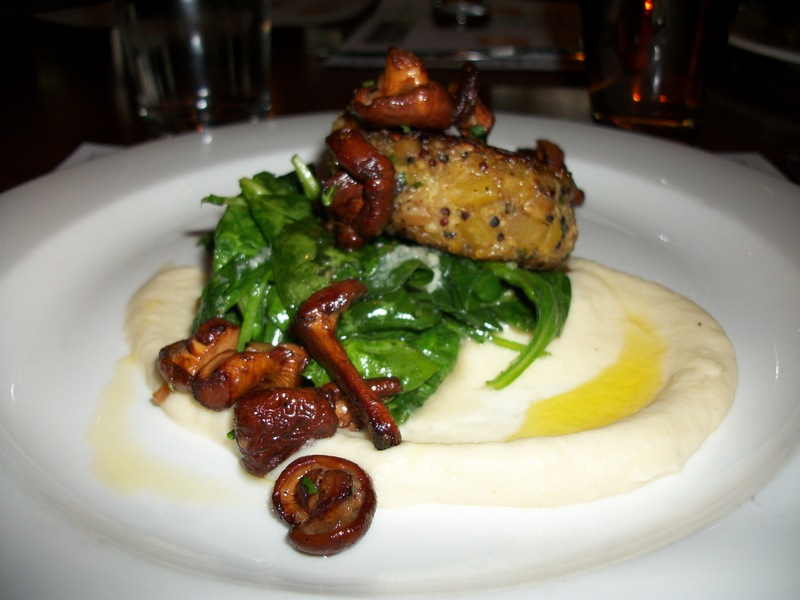 Being vegetarian, I am often unable to attend beer and food pairing due to the lack of meatless options. However, I inquired ahead of time and the chefs at Atwater on Gore Creek were very gracious in agreeing to make a couple of substitutions. Not only did they make “substitutions,” but they obviously put a great deal of thought and effort into these vegetarian dishes. 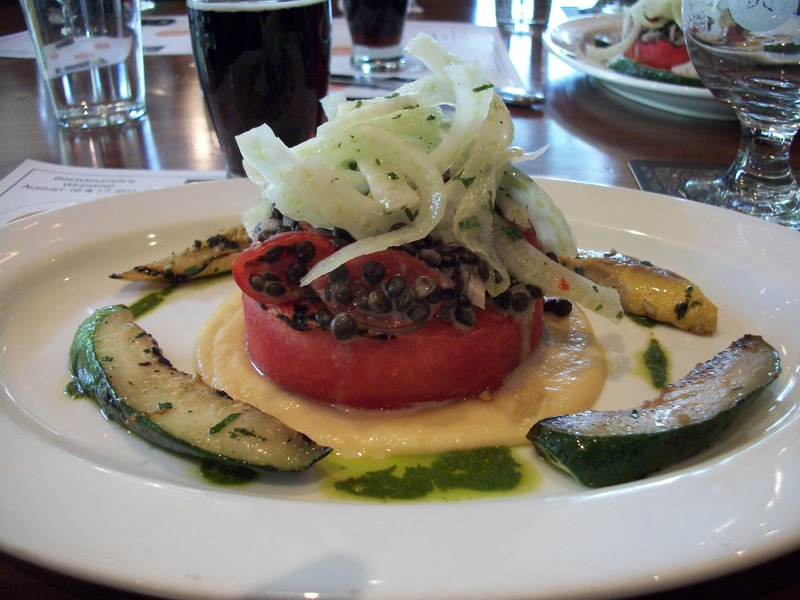 They served me Grilled Watermelon on a Yellow Lentil Puree, topped with a black lentil salad with balsamic, red onion, organic pear tomatoes, and fennel slaw, with grilled zucchini and squash. What a creative dish, both beautiful and delicious. It was served with Breckenridge’s Autumn Ale, which really brought out the grilled flavors of all the fruit and vegetables. Breckenridge’s Vanilla Porter was the first of their beers that really got me hooked many years ago. In fact, it can often be an excellent dessert on its own, or with a nice little scoop of vanilla ice cream. But this course…this was something else. 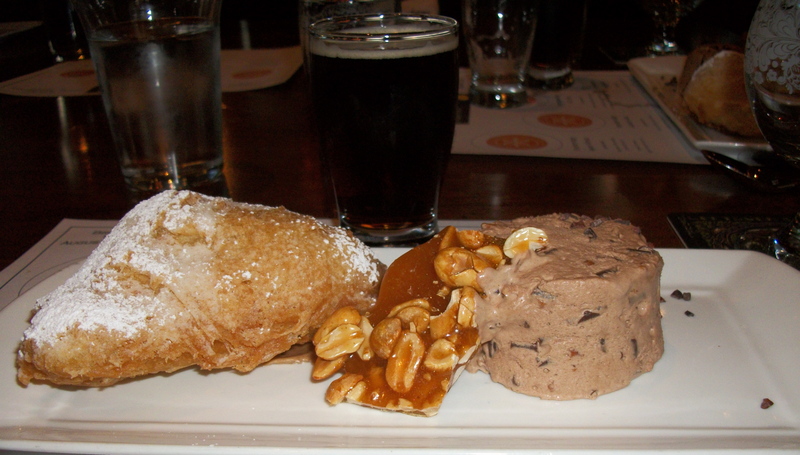 The Vanilla Porter was served along with Rocky Road Ice Cream Souffle, Peanut Brittle, and Fried Justin’s Almond Butter PB&J. I was completely astonished when this dessert plate was set in front of me; I didn’t know where to start with all this deliciousness! Everything went perfectly with the Vanilla Porter; I mentioned it’s wonderful with ice cream, and the fried PB&J was a fantastic idea as well. The peanut brittle was a bonus, as it wasn’t even listed on the menu–which thrilled me because I have a great love of the stuff. It was the best dessert pairing ever! Everything about this experience was mind-blowing. 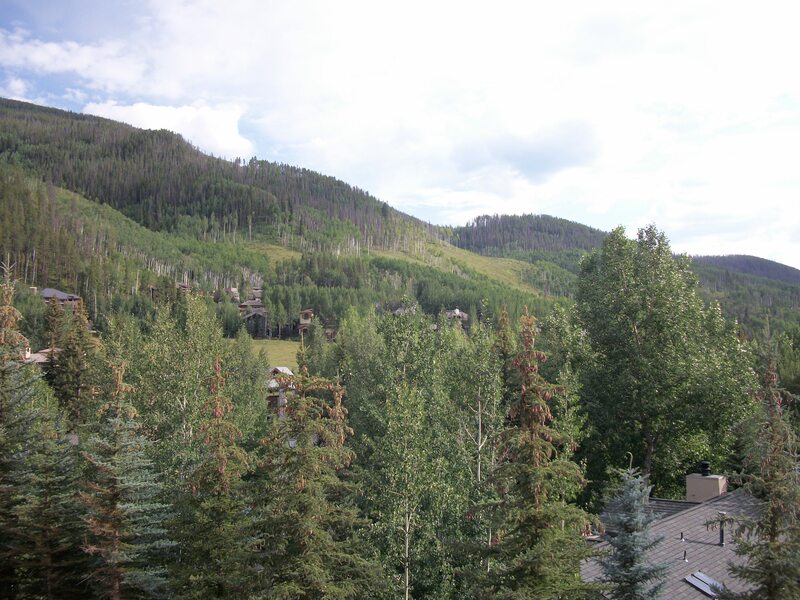 From the absolutely beautiful location–the Vail Cascade Resort and the picturesque scenery of Atwater on Gore Creek–to the pace of the dining, the brilliant dishes and pairings, talking to the brewmaster and chefs, and meeting new people. I truly appreciate that I was able to enjoy some vegetarian dishes thanks to the talented chefs. It was such a wonderful evening, and I look forward to attending more of these in the future. 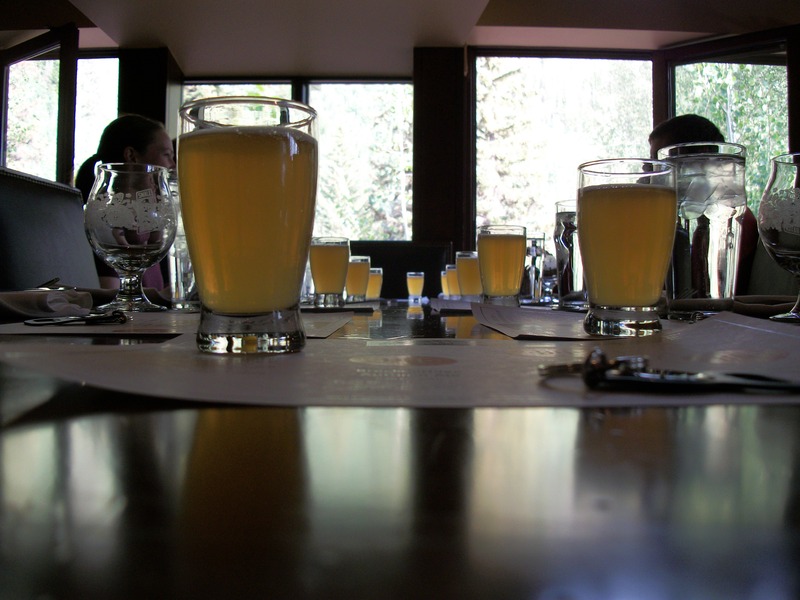 Click here for information on upcoming Brewmaster’s Weekends at the Vail Cascade Resort. For those who are into craft beer, food, and gorgeous views, this is the place to be. 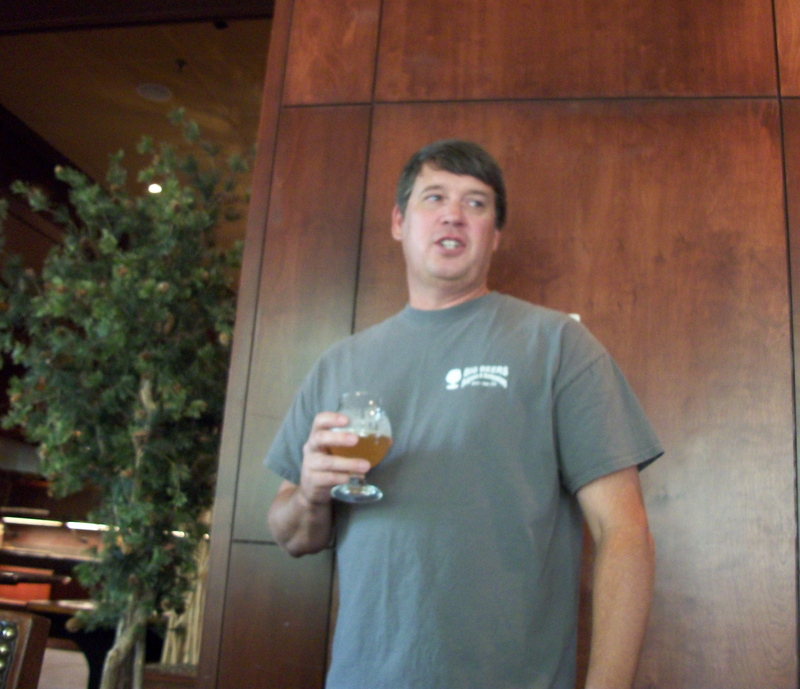 Vail Cascade has an excellent team who put a lot of thought into the availability of craft beer at the resort; don’t forget the Vail Cascade also hosts the annual Big Beers, Belgians, and Barlewyines Festival in January–tickets go on sale September 4th and most likely will sell out immediately. Thank you for a beautiful night of Colorado Craft Beer! Previous Post Big Beers, Belgians, & Barleywines Festival! Next Post Fermentation Festival & Market: Win Tickets!